We proudly offer a wide variety of activities for dog and human pairs to swim, play, relax and learn. There's a lot to do or nothing to do — it's completely your choice. All of Camp Unleashed activities are intended to optimize your dog's world and build the dog-human relationship. The focus is on organized play, not competition. Explore arts and crafts, canine massage, and fresh country air! Agility is an obstacle course that includes jumps, tunnels, teeter, A-frame and weave poles. You and your dog work together as a team to run through the course. Dogs jump, climb, tunnel and weave. Practicing agility with your dog enhances the bond between you and provides great healthy exercise for you both. Agility is relatively easy to start, and if you're advanced, our coaches will help you work on specific maneuvers or practice run-throughs. Scent work provides a stimulating and satisfying outlet for your dog's natural hunting instinct. you can teach your dog how you want him to use his astonishing powers. Learn how scent moves through the environment, search different areas and vehicles, you can even dabble in tracking! In barn hunt, Dogs and their handlers work as a team to locate and mark rats (which are always safely held in aerated tubes) hidden in a maze of straw or hay bales. Watching your dog learn new tricks gives you a new appreciation for canine intelligence. You can learn about clicker training, earn trick titles, and gain tricks to impress your friends and family! Learn about canine learning theory while teaching Spin, Sit Pretty, roll over, Shake paws, crawl and more! Flyball is a dog sport in which teams of dogs race against each other from a start/finish line, over a line of hurdles, to a box that releases a tennis ball to be caught when the dog presses the spring-loaded pad, then back to their handlers while carrying the ball. Flyball is run in teams of four dogs, as a relay. If your dog loves running for tennis balls, you with both love flyball! Our camps have private lakes that are available all day long for your dog to cool off, swim and play in. Swimming is the best exercise also for older dogs and being able to walk into a lake makes it easy for beginners as well as natural water dogs. Our Introduction class focuses on building joy around water for your dog and communication skills in water. Many dogs learn to swim for the first time at Camp Unleashed! Explore a fun new sport called Canine Water Sports. Not only is this a great way to actively spend time with your canine pal, it also opens a whole new aquatic environment for your dog to utilize their magnificent senses. In fact, being in the water with your dog, you can be literally eye-to-eye or shoulder-to-shoulder, bringing a fresh awareness to your connection. More advanced swimmers can learn to do easy water tricks on our water platforms. In dock diving, dogs race down a dock then fly off the end and into the water. Distance is the goal. Dock jumping isn't just for big retrievers — if your dog loves water and loves to jump, definitely give it a try! This is always an extremely popular part of Camp Unleashed and great for amazing flying photo ops! If your dog has never done it, we specialize in teaching beginners! Dogs love the new experience of traveling by canoe. They get to smell all kinds of new things and you will have a richer experience just by observing their senses at work. Learn how to safely condition your dog to enter and exit the canoe and maintain balance. Life jackets will be provided for both humans and dogs. Off-leash play in wide open areas is essential to a dog's well being. Learn how to encourage safe play, distinguish rough housing from potential aggression, and gain confidence in giving your dog freedom. Dogs love exploring the trails in the woods at camp. We offer something to appeal to everyone: gentle walks, vigorous hikes, 1/2 day hikes with picnic lunch, nature walks and mindfulness walks. 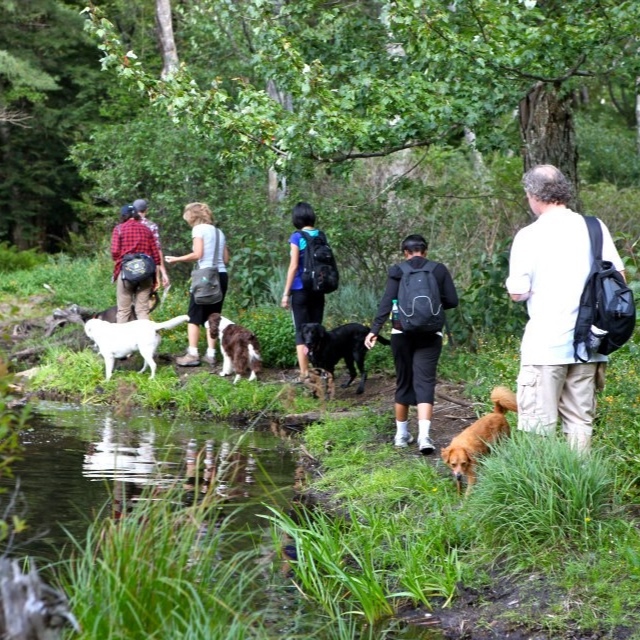 On hikes and walks the whole pack is focused on where it's going and you can observe how your dog enjoys and explores the environment off-leash. Parkour will teach you how to enrich your walks and hikes by using natural obstacles found in the environment! Show your dog how to go over, under, around, and across every day objects. It’s a great way to challenge your dog’s agility without any special equipment! Dog fitness will show you how to improve your dog’s balance, proprioception, and core muscles using special inflatable equipment. Learn proper stretching and warm up/cool down routines. through the use of energetic and playful games, learn how to improve your dogs obedience skills. get a better recall, improve your leash walking, and solidify your stays all while playing hide-and-seek, simon says, and team relay games. We also offer optional canine good citizen and akc trick titling opportunities. To understand what your dog is feeling, you need to learn how to recognize, read, interpret, and respond appropriately to your dog’s behaviors and communications. Our amazing Camp Unleashed instructors and trainers will help you learn how to speak and understand “Dog-Lish” as a second language. Learn intriguing insights into how your dog uses her body language to communicate with both humans and dogs. You can make a fun tug toy, decorate a frame for your dog's photo, create a dog brag book, or paint your pup! We're always adding new dog-related projects. Relax, enjoy some music, and sip a little wine while you chat and create with your dog resting at your feet. Learn how to give your dog a relaxing body massage by using basic massage strokes and specific massage techniques. Canine massage offers many physical and emotional benefits for your dog. It relaxes and tones muscles, increases flexibility, relieves discomfort from arthritis, builds the immune system, lowers stress/anxiety and enhances mental focus.